Once there are kids in the picture, simple things can become a little more complicated. Anyone else agree? Where once you could commit to serving once a week or could drop everything and give up a Saturday it is much more difficult. It’s simpler to say no and not find kid service projects. Sure, we might not be able to serve in the same manner we were before, but don’t quit all together! 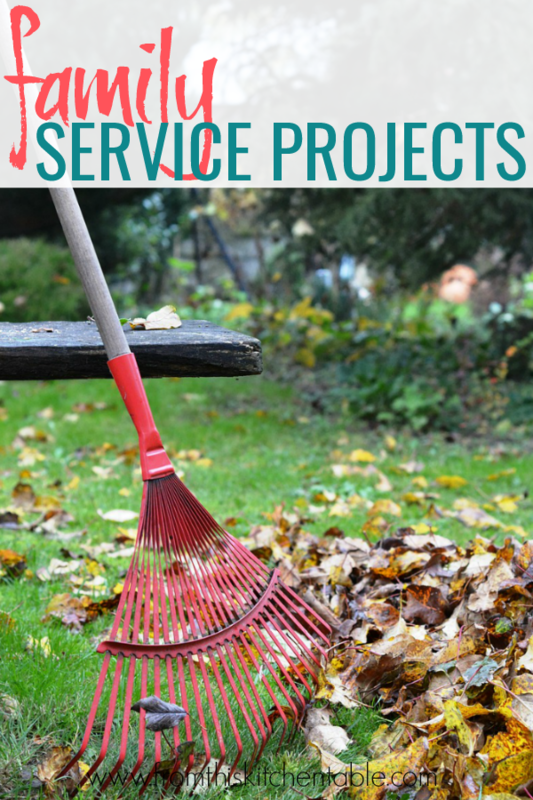 Brainstorm some kid service projects that would work with your family. Coming up with family service projects is also a great way to raise more grateful children. Throughout the year, I challenge each of us to purposely add a few hours of serving to our calendars. We can do this! We’ve been doing this since our oldest was a baby. Each of our kids makes a shoe box for the age group and gender associated with them. Why do we make them work? So that they are invested in the project and can take ownership. They can can feel good about what they actually worked to achieve instead of just having fun doing it with mom and dad’s money. After they work and earn money, they go shopping, select the items (with guidance if necessary), pack their box, and go deliver them to the drop off point. They love doing this every year – and I love seeing them work to be able to buy items with their own money and do so excitedly! And as they are shopping for kids that have so little, I can see their minds processing just how much they do have. With your child, find a child to sponsor. Look at Gospel for Asia, Compassion, and World Vision. If sponsoring a child monthly isn’t in your budget, many of those same organizations have “gift” catalogs where you can make a one time purchase of something like ducks, mosquito nets, school supplies etc. Like number one, let your child earn money to give toward this project. It likely won’t be enough to cover the entire child sponsorship, but even them doing extra jobs each month to have even some money to apply toward the sponsorship will make a difference. Doing things for others really can help broaden perspective and make you appreciate what you have. Many non profit organizations have plenty of jobs that can be done – even things like laundry or organizing. It may take some calling around to find a place that fits with what the ages and abilities of your children are, but there is something. My mom had us volunteering at a crisis pregnancy center as kids. We were able to do things like cleaning the bathroom and waiting room, putting together newborn bags, organizing the clothing room. During the Christmas season there will most likely be even more opportunities. Look for places serving meals, that need presents wrapped, cards mailed etc. Don’t forget about your local church either! Often times there are ample opportunities to step up and volunteer. Even simple things like setting up before a potluck, staying for kitchen duty, showing up to a clean up day are great kid service projects. The next time you are making bread, cookies, or cinnamon rolls why don’t you make up some extra and deliver them to your neighbors, widows you know, someone who is going through a hard time, emergency responders etc. Doing little things for others really can make us more grateful for what we have. You could also have your kids draw or write cards to go with the goodies. Be aware. This requires slowing down. And it’s hard. Train yourself to notice needs and people around you, let your kids see you listen and act. I have a friend who is so good at this it always amazes me. Bringing meals, visiting the sick and lonely, cleaning out gutters, running to the store, stocking a refrigerator, being a listening ear – this person has served so many people just by taking the time to listen, ask, and act. Again, this is a simple thing to do with your kids! They can help you cook, bake, and deliver! It can be easy to dismiss doing things because they aren’t big or important, but the little things can be just as appreciated. Many a new mom (raises my hand) and under the weather individual has been blessed by supper being dropped off. We are cooking anyway so we can make extra and be a blessing without a large time or financial commitment. During the holidays, look for an organization that is providing presents for kids that wouldn’t otherwise get anything. Our church even does a gift tree some years. Find an item that’s in your budget and have your kids go shopping. You could even have your kids earn money to purchase items like we do for the shoe boxes! During the rest of the year, ask a children’s home, foster family, shelter if there are any birthdays you can help with. A lot of kids have basic needs met by these presents. Go to the neighborhood park with trash sacks and gloves to pick up litter. Rake the home bound person’s yard. Shovel your neighbor’s driveway after doing yours. All simple things that cost you nothing and your kids could work alongside you. 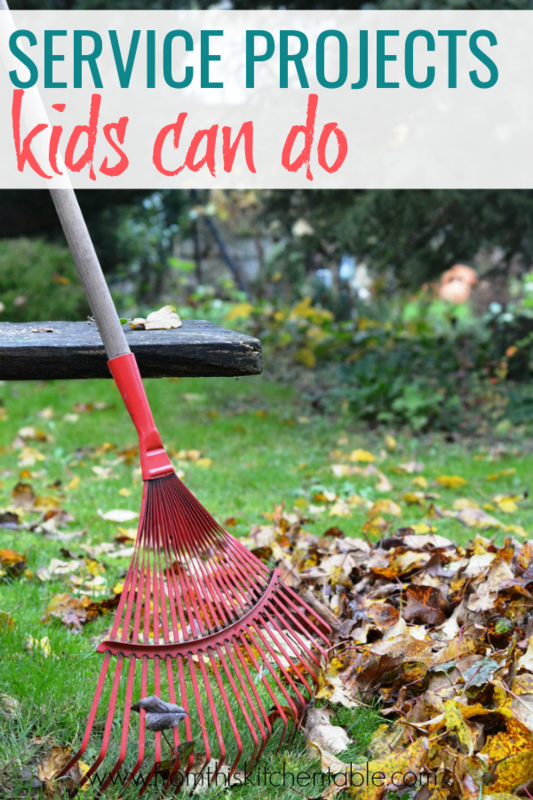 Do you struggle to find time to come up with kid service projects or family service projects? Have you found any ways to serve with kids that have worked well? Share in the comments, I’d love to hear! 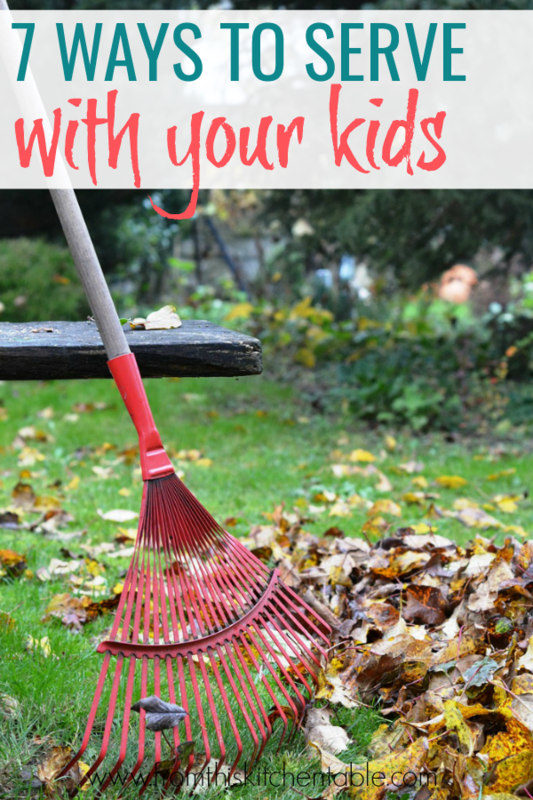 This entry was posted in Family, Parenting on October 25, 2018 by Deanna Michaels.